Venezuela: In the economic war, the masses advance | Fight Back! Milwaukee, WI - On May 20, the revolutionary forces of Venezuela won a great victory with the re-election of Nicolás Maduro as president, who received a landslide 67% of the vote. The reactionary opposition parties, stumbling over themselves, ran a sub-par candidate that they could not even unite behind. For the foreseeable future, the political forces of the comprador bourgeoisie are defeated, and they and their imperialist partners will need to explore other means to try to defeat the Bolivarian Revolution. Now is the time for the revolutionary movement to advance, and that is what they are doing. Nicolás Maduro, president of Venezuela and head of the United Socialist Party (PSUV), is committed to driving imperialism and its lapdogs from the country. Since May 20, his administration - and the broader Bolivarian movement that it leads - has launched a sweeping offensive against the vestiges of entrenched comprador bourgeois power that still hold on to key sectors of the economy. The goal is to create a stable, sovereign national economy capable of meeting the needs of the Venezuelan people and enabling them to fulfill their revolutionary desires. Venezuela has been in severe economic crisis for years, the product of sharp class struggle and imperialist meddling. The comprador bourgeoisie, although weakened by their political failures, continue to use their dominance of the imports and distribution sectors to strike blows against the masses. Goods are hoarded, prices are gouged, and the fuel for crisis is made. Criminal elements actively aid the bourgeoisie in these efforts. It is at these key sectors of the economy that the Bolivarian movement now aims its sights. 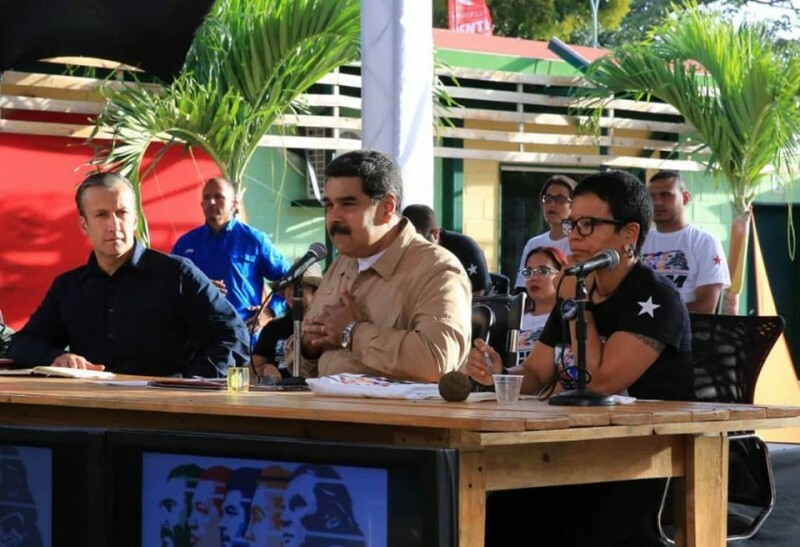 To this effect, Maduro announced that the Sovereign Supply Chain Mission - a government body that combats corruption in the imports and distribution networks - would seize control of all local markets in the country. “The people demand a cleansing of all the local markets in this country, that we take all of the mafias away in handcuffs,” Maduro said a week after his re-election. “It is not socialism that is failing us, but this old savage capitalism that lives on like a zombie, plunging its claws into the people and preventing them from buying [what they need] with their high prices.” He added that any local officials that worked against the seizure of local markets would be treated as sympathizers of the “mafias” currently holding power over the local markets. As battles wage between comprador and revolutionary forces in the private sector, efforts are underway to strengthen the large state-owned sector of the economy. Productive forces need to be further developed if Venezuela is to survive outside of the imperialist world. All revolutionary forces are working to construct this new economy. Agricultural communes are developing new methods to grow and process corn and other food staples. Workers are taking control of their factories, taking advantage of a new law that allows Worker Production Councils (CPTs) to legally seize and run their own workplaces. While these revolutionary efforts are underway, work is being done to strengthen the existing state-owned businesses. On June 29, Maduro directed the Francisco de Miranda Front (FFM) - a cadre youth organization jointly organized by the PSUV and the Cuban Communist Party - to take managerial control of over 700 state-owned companies in order to strengthen their productive abilities and ensure they function in the national interests. "Prepare yourselves, form into cells, because I want the best of the working class to take control over these companies!" Maduro declared before an assembly of FFM leaders. The youth will be assisted in this grand project by experienced officers from the National Bolivarian Armed Forces, who have been active in managing some of these companies for years. The Venezuelan masses are hemmed in by enemies at home and abroad. On their border, the far-right regime of Ivan Duque is coming to power in Colombia, and he has made it clear that his central foreign objective is defeating the Bolivarian Revolution. Steps are certainly underway for the Colombian military, a full member of NATO, to attempt such a feat. They will be backed to the hilt by the Trump administration. It was leaked this week that, months ago when Trump and his advisors were discussing Venezuela, he incredulously asked why the Marines could not be sent in to overthrow Maduro. While this option has not been attempted yet, it is clearly on the table, and is beginning to look like the last option the imperialist have left. Despite these real threats, the Venezuelan people have no fear. They know what they want, they know how to get it, and they are willing to get there. Challenging times are ahead. The Venezuelan people's desire for independence cannot coexist with the profit hunger of U.S. imperialism. This contradiction is sharpening and will reach its breaking point. There are only two paths available for Venezuela - forward or backward. The present cannot last. The choice is now more than ever, to push forward the national democratic process towards socialism or barbarism.